From left to right: Crowds gathering at the adoption booth, our volunteers with MP Cedric Foo, Sunday’s winner Manja, Saturday’s winner ScarfaceWhat a weekend! It was an intense two days from 9-10 June at a roadshow co-organised by AVA, Jurong Point and Cat Welfare Society. The roadshow at Jurong Point reached out to the masses with a host of activities including celebrity appearances by Irene Ang and Chua En Lai, an adoption drive, stage games and talks as well as the “Most Beautiful Domestic Cat” contest.The roadshow aimed to entertain and educate heartlanders about the need for responsible pet ownership, and how they can play a part in ensuring their pets’ welfare. It also reached out to non-pet owners to create better understanding about pet and stray issues. There were many visitors to the adoption booths, where they got to interact with some of the cats, dogs and rabbits looking for homes and learnt how to make their homes safe for their new animal companions.The education booths saw numerous animal welfare groups like the House Rabbits Society of Singapore and Animal Lovers League alongside AVA and Pet Lovers Centre coming together to promote the importance of creating a harmonious living environment for everyone.Our “Most Beautiful Domestic Cat” contest was the highlight at the Centrestage in the indoor stage area. Each day, a contest was run with none other than our local domestic short hair cats in the parade. Proud papas and mamas dolled up their cats and brought them out. It was a very tough call to choose the winners as the cats were all beautiful. Their stories of rescue and adoption were inspirational as well. On the first day, Scarface won. He was the tough ginger tom cat who had spent a lifetime on the streets and had to be rushed to the vet with dripping wounds all over his face and limbs. On the second day, Manja, the 12-year-old cat who stayed up “studying” with her owner after being rescued from the streets, won. But the competition was not really about winning. It was more to put the spotlight on the plight of our local cats and how their lives can drastically change for the better when they are adopted into responsible and loving homes. 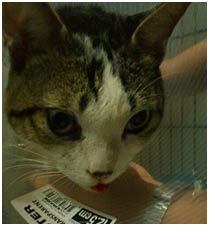 The first of two Spay Days in 2012 concluded on 25 May. It was incredibly exhausting but entirely fulfilling. Not only did we sterilise 320 cats, with the help of volunteer groups we also managed to incorporate an education component. Photo credit: PochMauiPhotographyThe morning saw the cats being dropped off at either Ang Mo Kio or Bedok and after the tagging and securing of the carriers, they were delivered by our volunteer drivers to the various vets island-wide. The volunteers paused for a breath and a sip of coffee and then it was off to walk around the Ang Mo Kio neighbourhood to speak with and educate the residents on the welfare of community cats and responsible pet ownership. Most residents and shopkeepers were found to be tolerant of the community cats. In fact, quite a few shopkeepers were the cats’ caregivers. Although we encountered some people from the older generation who were hard to convince, they accepted that even though they did not like cats, they did not want to see them abused and hurt. Educational booklets with translations were also handed to them. Photo credit: PochMauiPhotographyWe could not have done this without the help of all the caregivers who sent their community cats in, the transport volunteers and all those who took a day off to help manage the programme on the 25th. On behalf of the cats, we would like to thank each of you for all your assistance and care. The second spay day will be in October – watch our website and Facebook page for details in due time! We are dedicated cat lovers. Many of us are also dedicated to yummy treats and will om-nom-nom them quite readily. Now there’s an awesome reason to keep on om-nom-ing – the BAKEOFF!! 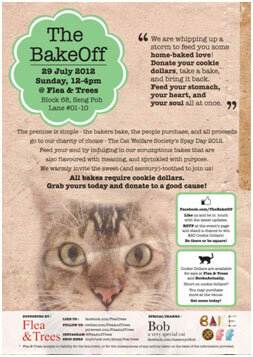 Organised by the lovely BakeOff team with the support of Flea & Trees, with special thanks to Bob the cat, the BakeOff is simple in premise – bakers get together to sell their baked goods, eaters get together to buy baked goods and eat. All proceeds go to helping our community cats. “Feed your stomach, your heart and your soul all at once” they say and we agree. The BakeOff will be held on 29 July 2012, from 12-4pm at Flea & Trees (Blk 68 Seng Poh Lane, #01-10). You will need cookie dollars to transact on the day – these are available in advance or at the door. I decided to help with the trappings at the Pusara Abadi Cemetery after seeing the photos on the CWS Facebook page. 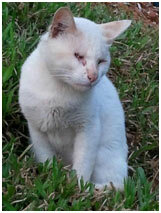 An estimated 30 cats live in the area. I met up with a group of volunteers and we were briefed on the areas we needed to cover. We split into pairs and armed with traps and carriers, we scouted for unsterilised cats. Despite the rain, we pressed on, looking for cats hiding amongst the tombstones. 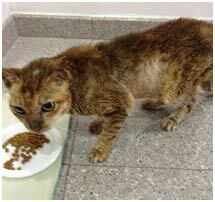 Once we spotted the unsterilised cats, we were supposed to inform the caregiver or professional trapper. Those of us with experience could start setting up a trap or if the cat was friendly, try to catch the cat. In their enthusiasm, two other volunteers were scratched when trying to catch a cat. This shows the important of thinking about safety even when we have the cats’ welfare at heart! While trapping, we met a caretaker who was extremely uncooperative about sterilisation. Thankfully, the other caretakers there understood the importance of managing the population and even assisted in the trapping process. All they wanted was for their cats to be returned after sterilisation. It was exhausting but fruitful. The trappings and sterilisation efforts will have to be continue to ensure that the colony there is truly being managed. Books Actually had a little talk on 30 May with CWS as part of their regular Well-Informed Wednesdays series. Their regular patrons are invited to sessions with different organisations and this time, it was us. Just in time for the “Cat vs Human” launch as well. The cosy atmosphere and conversations made it an evening to remember. Our adoption drives continue on the first Sunday of each month. Join us in July for the drive at nex and August at vivo city. If you are thinking of getting a pet, or know someone who is, please visit the adoption drives. There are so many animals looking for a loving family and life off the streets. Please adopt. Residents in Ulu Pandan, do come join in this community event where there will be dog obedience demos, dog talent time competition and cat care talk amongst other fun activities! Join us and other animal welfare organisations at the Mountbatten Pets Carnival from 2-6pm at Katong Park. With competitions like “My Pet Got Talent” and “Cutest Pet Online”, it’s going to be a great day of fun.